“Streamlined Pioneers” seek utopia on East Caicos. Newspapers all over America called them “Utopians,” “Streamlined Pioneers,” “Modern Crusoes,” “New Life Seekers” and “Colonists.” These were just a few of the monikers given to a group of 19 Californians seeking “to get away from civilization as it now operates for the lesser-privileged.” Group leader Richard C. Irvine said, “We have a chance to attain a security we cannot get in the United States because of uncertain social conditions and the terrific differential in wage scales and taxes.” Sound familiar? Like something you might read in the papers today? No—this was 78 years ago! In late 1939, a party of five California families and three bachelors, totaling nineteen, formed a closed corporation they called the East Caicos Trading Company. They sold their homes, left their jobs and friends and prepared to move to East Caicos, the largest uninhabited island in the Turks & Caicos. Members of the group ranged in age from 17 months to 69 years. Among them were a traveling salesman, a carpenter for Walt Disney, a housekeeper for Mary Pickford, a retired Standard Oil Co. engineer, a horticulturist, an electrician, an insurance investigator and a nurse. It was reported that members of this group were selected from “hundreds” that replied to advertisements—however, no such ads have been found to date. 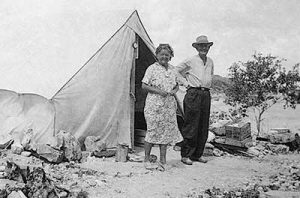 Grace and James Lake stand in front of their tent on East Caicos. They selected East Caicos because Mrs. Grace Lake (née Reynolds), a member of the group, owned a large tract of land there. Grace Lake’s Irish father, John N. Reynolds, moved to the Turks & Caicos Islands about 1856 and became a salt merchant with salinas on South Caicos. As trustee for his four children, Reynolds acquired 1,288 acres at Breezy Point on the north shore of East Caicos in 1871, as well as a 99-year lease from the British Government for most of the rest of the island. His initial intention was to raise cattle and supply meat to neighboring islands. By 1884, Reynolds was extracting and selling bat guano from caves in the interior for fertilizer. He was also involved in the sisal industry that began there about 1890. The guano played out in late 1880s and, unable to compete with the superior qualities of manila hemp from the Philippines, the sisal operation ceased about 1919. 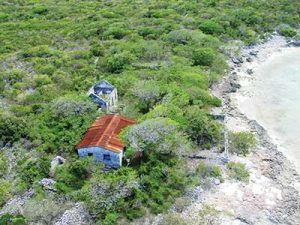 Abandoned when both these commercial operations failed, substantial industrial and residential structures still lie about the island, including a narrow gauge railroad built to move sisal from the fields to the processing area. Grace Reynolds was born on the Turks Islands in 1881 and lived there until she moved to Boston with her mother Elizabeth and three siblings in 1890. With the death of her brother John Jr. in 1925, Grace became the sole owner of the property at Breezy Point as well as the years remaining on the 99-year lease. She married her second husband, James Lake, in 1925. It is not known when in the late 1930s the Lakes moved to California from Massachusetts or how they met Richard C. Irvine, who became the leader of the group of Californians seeking a better life on East Caicos. Records show that James Lake returned to New York from a trip to the Turks & Caicos in April 1934. Recounting his experiences on this trip, Lake told the California “pioneers” that he visited East Caicos and found it to be a virtual “Paradise.” He excitedly described the island as covered in hardwood forests (mahogany and lignum vitae) as well as papayas and fruit trees. Other resources of potential economic benefit included hundreds of wild cattle and thousands of wild donkeys from the days of the sisal enterprise twenty years earlier. The sisal industry, he said, had also left behind two concrete 35,000-gallon water catchment tanks that would provide fresh water for the group. There was even talk that East Caicos was once the haunt of the pirate Henry Morgan, suggesting buried treasure was a possibility! These ruins can still be found at Jacksonville, East Caicos. Roughing it was not part of the plan. James Lake and Richard Irvine explained to the group that they would initially live in tents and later build permanent homes from the lumber they would harvest from the hardwood forests. They could support themselves by selling the cattle and donkeys roaming wild on the island for meat and hides and the bat guano found in the caves for fertilizer.There was also sisal to cultivate, and papaya fruits and shark liver oil to turn into medicinal products. In addition to the many resources waiting for them on East Caicos, the “adventurers” brought clothing, tents, food for three months, and tools for building homes and growing crops. They reportedly shipped separately several tons of goods including electrical generating equipment for lights, hundreds of seeds, additional tools and radio equipment to establish a broadcasting station. These items were shipped from California to Jamaica where they would eventually be forwarded to East Caicos. Whether or not these supplies ever reached East Caicos is unknown. There was a report that the shipment was held up in Panama because of lost documentation. The trip to “Paradise” began on January 16, 1940, with the group leaving California for Florida in two cars, a truck and a trailer. Each family paid between $1,000 and $2,000 to participate in this venture (roughly equivalent to $17,000–$34,000 today!) Group leader Irvine stated that the total cost of the venture was $10,000 ($170,000 today) and that he expected they would be self-supporting within three months. The journey to Florida was difficult and many in the party were sick with colds by the time they arrived in Tampa on January 24. They sold the automobiles, truck, and trailer in Miami and two or three weeks later signed an agreement with George Conley and Capt. Gaston Blum of Chicago to provide transportation for the group to East Caicos on the yacht Spindrift. The group left Miami on Spindrift for East Caicos on February 18, 1940. The agreement between the Conley-Blum syndicate and the “colonists” included free transportation to East Caicos in exchange for rights to develop the island into a tourist resort. Conley and Blum were to promote the island back in the U.S., transport more people and supplies to the Island, and eventually establish a resort there. Colonizing East Caicos was beginning to look more and more like a business-for-profit venture and less like the co-operative colony originally envisioned. 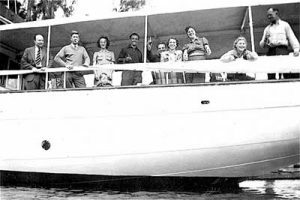 Members of the group on Spindrift in Miami just before departing for East Caicos in February 1940. Spindrift arrived at East Caicos on March 2, 1940. The weather had been terrible and the passage was rough—forcing them to lay over in Key West and again in Cuba. When the passengers finally arrived at their destination, they were seasick, tired and almost immediately disappointed. Spindrift had to anchor offshore due to the coral reefs and shallow water that surround the island, requiring many trips ashore by tender to move people and supplies from the yacht to the beach. By the time everything was on shore, it was late and the “pioneers” were hungry. Their first meal ashore was bread and canned fruit, though it was reported that some of the men speared lobsters to boil and eat later that evening. Since there was no time to set up tents, the “adventurers” camped under the stars on the beach, but the fierce mosquitoes and constant braying of wild donkeys made sleep on East Caicos that night impossible. The following day they draped a canvas tarpaulin over the walls of an abandoned and windowless shell of a building left by the sisal company, supporting it with rails taken from the old railroad. This was where their supplies would be stored. Inhabitants from neighboring islands, curious and looking for work, traveled to East Caicos. They were each paid 50 cents a day to clear an area of scrub, bush and sisal so the settlers could erect their tents. Two or three days after their arrival, the eager “pioneers” went forth to survey the island and locate the valuable resources promised them. It was not long before they realized that there would be no beef to eat—hunted out years earlier, the cattle were gone. There were donkeys, but in smaller numbers than expected. It looked like fish and possibly donkey would be their only sources of protein and the only fresh vegetables were those they could buy from the inhabitants of nearby islands. There were no bananas, no papayas or other edibles growing on their newfound home. Not only were the cattle gone, but also the guano they intended to sell had been depleted years before. There were no hardwood forests. There did not seem to be any resources they could sell to make money, and their money was already running short. Adding to their problems, the yacht Spindrift did not return with more people or supplies. Within days, sunburn and infected sand flea and mosquito bites were taking their toll on the group. The Irvine’s 17 month-old baby was covered with infected mosquito bites and tempers were growing short. Some members of the party were no longer speaking to each other. After just four weeks on the island, group leader Richard Irvine, his wife, their four children and 18 year-old bachelor Ned Read left for Miami. Another couple, Mr. and Mrs. E. A. Lawrence, left at the same time, but took a different route arriving in Miami on April 12, 1940. Reportedly, Mr. Lawrence kissed the dock and danced a jig when he landed there. The Irvine family and Ned Read arrived in Miami on April 15, 1940. Richard Irvine told reporters he might return to East Caicos, but his wife said, “You’re crazy if you come back, Caicos is a desert.” Ten members of the group remained on East Caicos, including James and Grace Lake, who told the departing members of the party that they intended to “stay and tough it out.” Andres Lornsten, the retired Standard Oil Co. engineer, took over as group leader. Exactly what happened on East Caicos after nine members of the group departed in April 1940 is unknown. However, it was reported that Boyce Phillips told the departing members that he would soon be heading to Panama to work for the government. Passenger lists show that Cletys Ackerman and Hjalmar and Greta Kvanvig left East Caicos in July, arriving in Miami on August 8, 1940 aboard the vessel Betty K from Nassau. Passenger lists recorded that Grace Lake arrived in Miami on February 14, 1942 and her husband, James Lake, arrived a year later on April 10, 1943. There is no information to explain why they arrived separately or whether or not they remained on East Caicos until they returned to Miami. Andres Lornsten, his wife Isabella and their two adult children arrived in Key West in 1945. It is not known if they spent five years on East Caicos or somewhere else before returning to the U.S. While we do not know when the last “pioneer” left East Caicos, it is certain that they did not succeed in establishing a viable colony there. There is reference to the repatriation of the last members of this group, possibly the Lornsten family, during WWII partly at government expense—but exactly which government is unclear. Nonetheless, within a few years the island was once again uninhabited—left to the donkeys and mosquitoes. Not long after the Utopians’ abortive attempt to start a new life on East Caicos, Grace Lake conveyed the Breezy Point land she owned to her daughter, Alice L. Christensen, a Bermudian by marriage. In May 1949, members of the Christensen family went to East Caicos to determine if it could become “another Bermuda.” They were disappointed. In 1968, at the suggestion of a friend, retired British S.O.E. (Special Operations Executive) officer and journalist John Houseman moved to East Caicos with his wife and two children, with the intention of establishing a hotel. A few months after setting up camp, Houseman’s wife left him and the plan collapsed. In 1970, the Christensens sold the property to the Solar Group of Bermuda. The Breezy Point property is now owned by the Arden Group of Philadelphia, and is currently listed for sale. Thanks to Ingrid Pohl and Janet Pohl-Schollenberg, Tom Ellis and Dr. Donald H. Keith, who helped me research this story. It would be great is anyone reading this article who knows what happened to the group of Californians who took part in this adventure would get in touch with me. I would like to know what happened to them after they left East Caicos. You can reach me at tinqua@aol.com.